Available as a sedan or hatchback, the 2017 Chevrolet Sonic slots between the Spark and Cruze in Chevy's lineup. Freshened this year, the Sonic presents an even better option for younger drivers or commuters on a budget with the addition of Apple CarPlay and Android Auto compatibility and available features like built-in Wi-Fi not usually found in a subcompact car. Nice value, joy to drive daily/road trips, but prepare for glitchy touch screen. Overall, this is a perfect car for my needs. Good gas mileage, sufficiently modern features, it is a smooth ride and get a surprising amount of complements for such an affordable car. They made an effort to give this car a sporty, youthful look. Having owned an Aveo for 11 years immediately prior (the Aveo was replaced by the sonic and the more basic spark) and being told by every single mechanic during that time that they were astonished it had survived (basically, the Aveo was not known to be a reliable car; I got lucky and also had babied it and kept on top of my preventative maintenance), I hadn't planned to go down the same road, but read enough reviews saying most of the problems with the Aveo really were addressed. I can speak from experience it is like night & day. With the sonic I do not feel like I am driving a scary, loud tin can. To be fair, I have the premiere turbo version; I definitely recommend the premiere if within budget. (The turbo I am not sure if it is worth it - has a lot more power than my Aveo and feels solid, but takes a while to get up to high speeds; I do not think this is what turbos usually feel like). Now for the negatives: basically the console computer is amusingly low-rent. Having one at all gives the impression the car is a lot more fancy/modern than it is, but it is a real problematic, ancient seeming software. The layout is ridiculous - huge screen will have two tiny buttons in a corner so you have to avert your eyes from the road to press anything; you cannot use your peripheral vision. The automatic brightening will randomly fail (problematic on a road trip when my directions suddenly go dark as though it is night outside and I cannot see them at all for 20 minutes - this has happened a dozen times in the months I have owned it). Phone syncing is awkward - if you are on a call and get in your car, do not expect a smooth transition to hands-free; it takes sometimes a couple minutes of “can you hear me now? ?” To finally resume your call. And again with the buttons - if I want to accept or dismiss a call, why are there two tiny circles I have to aim for?? Half the screen could be green and the other half red. . Just a very unattractive and unimpressive system. Now, I don't really care, my last car had manual locks so this one still feels like a spaceship, you should just know though to expect a glitchy, and very cheap, console computer. The trunk is the bomb though (I have the hatchback) and the car feels very spacious for being so small! Cupholders in the middle are too awkward to use, but there are nice ones in the doors. I think it is honestly a great value for its price range overall. Built in rear view mirror. 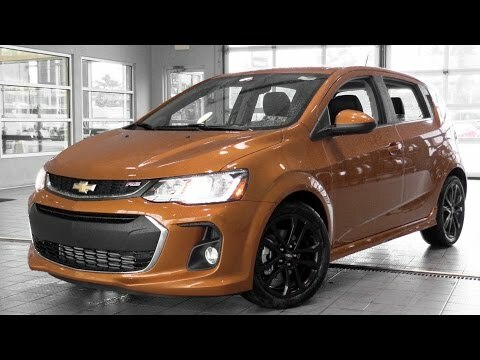 This car, 2017 Chevrolet sonic, is a really nice car. It has a rear view mirror built into the radio so you can see directly behind you. It comfortably fits four people and also room for a baby seat. I have only had to take into the car maintenance garage once while I have had it and that was for an oil change. That is another great feature about this car. There is a menu button inserted into the left hand side handle and it tells you how much oil is left in your vehicle. I have had to take it in when it was around 25% oil life remaining. The price was great around $20, 000. I do not think I could have asked for a better car than this one for the money. Chevy sonic - reliable first car. The Chevy sonic is the perfect car for a first or second time car buyer. It is ideal for someone with a short commute to work although it will go a long ways if needed. It is very reliable in the warmer months of the year but tends to have some issues with the winter months and performing at it is best. Since it is only two-wheel drive, it is quite obvious it would have issues with driving in the winter but overall if tires are kept in good shape, you are bound to have a great experience with your Chevy sonic.